ANDREW ROSS SORKIN: In the meantime, we want to get to the other side of the coast, Pebble Beach. Joe and Becky are standing by with another big guest. Joe. JOE KERNEN: Thank you, Andrew. JOE KERNEN: That is true. Yep, Becky. Go ahead. BECKY QUICK: We’re both here. Joining us right now is the host of the Pebble Beach Pro-Am, AT&T Chairman and CEO Randall Stephenson. Randall, thanks for being here. RANDALL STEPHENSON: Thanks for having me. BECKY QUICK: You know, I was walking the course yesterday, seeing the AT&T signage everywhere, watching it get picked up on CBS, all the places where it’s getting played. And I just started thinking about The Super Bowl and how it’s now $5 million for 30 seconds in the Super Bowl. I don’t know how much this costs, but is this a — is this more or less than that? How do you kind of look at this and think: Okay, this is what we’re spending and this is why? RANDALL STEPHENSON: Well, I — we’ve never disclosed what we pay to sponsor this. I hope Jay Monahan is in bed, because he’s the guy we negotiate these deals with. But I would tell you, this is the best ROI of any advertising promotion that we do. And you know, we’re interacting with some of the biggest customers in the B2B world — in the world. And it’s a great event. It gets great carriage for both the consumer as well as businesses. It just crosses the boundaries on multiple demographics. So we just love this event for that reason. RANDALL STEPHENSON: Well, they’re playing with live ammo. You’re in there inside the ropes playing the same game they’re playing and your shots matter. It’s just — it’s really strange. Think of what other sport exists where amateurs get into the live play with the real athletes and get to see them up close and in person? JOE KERNEN: And everybody shows up for this too, as far as the pros. RANDALL STEPHENSON: Yeah, it’s a great event. It really is. BECKY QUICK: Randall, I want to talk to you about the disappointment the Street had with earnings last week. Stock was down and I think it was the surprise in decline of subscribers, both at DirecTV and DirecTV Now. There are people questioning on the Street whether you can turn the TV business around there. What do you say to them? RANDALL STEPHENSON: I – the results were really right in line with what we told the Street back in November. And we had said we expect to see continued declined in the traditional video business and what we are doing is now investing in a new streaming service. It’s over in Warner Media. And you know, now that you own a large scale media company, the idea that you can now build an SVOD: a subscription video on demand service that is premium, that is unique, it’s leveraged off the HBO content, the Warner Brothers’ content, that is where the investment is going for streaming television, a SVOD service. The traditional linear, we expect it to continue to decline. We expected that when we bought DirecTV. We’ve generated a lot of synergies with that acquisition. It was a typical synergy deal. You buy a declining business, you extract a lot of cost synergies. And people forget, within 18 months we had generated about a $3.5 billion run rate synergy in this business. Still generating $4 billion of cash flow. That $4 billion is now being invested in the new platforms. So it’s being invested in fiber deployment and the fiber deployment is going great. In fact, our Broadband business in the quarter was up 6%, 7%. We’re investing in an advertising business. And by the way, since we bought DirecTV, we have stood this advertising business up. It’s a very unique business. It’s a $2 billion a year business now and it grew 26% last quarter. So we’re investing in that and investing in the SVOD. So what you’re seeing is investment in the traditional linear goes down, you’ll see subscribers continue to go down. As we stand up the SVOD service, you’re going to see significant growth over here. That’s where our excitement is, that’s where we’re putting our focus and our investment. JOE KERNEN: Would anything else be possible if you didn’t do DirecTV, do you think? It gave you a footprint, didn’t it, to do this? RANDALL STEPHENSON: It would have been really hard to execute this strategy had you not done DirecTV. Because you needed some basis to get content delivered to mobile. The world of mobile. That’s what we’re always trying to accomplish. And we have been trying to do that for many, many years. We actually got that done. We got all of the rights to begin distributing to mobile within months of closing DirecTV. And so now you do a media company, you own a media company, and you also have a great IP and you stand up a new SVOD service, Video on Demand service. Now you have just built in distribution for this SVOD. Not traditional DirecTV subscribers, but through your mobile subscribers. And so the two work hand in hand. And the next two or three years, bringing these two together, standing these up and distributing. JOE KERNEN: I mean is there a shareholder class that just is wants more near-term results? The — it wasn’t identical to what Comcast experienced with Sky, but initially looks like a great asset. Comcast killed to get it and yet the stock, some people decide: Look, the debt is going up too much, it is going to be — the payoff is going to be down the road. But if you’re building something for the future, do you see it the same way, who are the shareholders that decide: I’m not going to be here so if the stock goes down but long-term you say two or three years? RANDALL STEPHENSON: That’s what concerns people. And I recognize that. And I have said number one focus for 2019 is to address the debt situation. So think about what has happened here. We put on $40 billion of debt to do time warner. That was done in June. By the time we got to end of the year, we had paid down $9 billion of the $40 billion. By the time we get to the end of the year this year, we’ll have paid down 75% of that debt. So the ability to service this debt is very, very achievable. We’ve told the Street straight up, you should expect us, after some of the highest capital spending in the U.S. to generate $26 billion of free cash flow this year — we just did 7.9 in the last quarter, 7.9 billion in one quarter. $26 billion, we’ll pay a 14 billion dollar dividend. There is $12 billion of cash that will go to debt pay down. We have asset sales that are stacked up of 6 to 8 billion. There’s about, you know, 30 some odd billion dollars. So you’ll get to 75% of the debt paid off as we exit this year and imminent line to sight doing the rest in 2020. BECKY QUICK: You did mention though $14 billion a year in dividends. I think the yield is something like 6.9%. And that has some people starting to wonder, I think the majority of analysts still believe that the dividend is completely safe. Is there any chance that you would either reduce or freeze the dividend for any point of time to pay down that debt faster? RANDALL STEPHENSON: The reality is that we don’t have to talk about that. When you generate $26 billion of free cash flow and a $14 billion dividend, that’s not even in the equation. You have $12 billion after paying the dividend. And that is while you’re investing at the highest levels of anybody in the United States of America. So the cash flow characteristics of this business are really unique. I mean they really, really are. Think about coming out of the first full quarter where we own Time Warner, and we have record cash flow, record operating cash flow, record free cash flow, free cash flow is up 70-some odd percent for the quarter. And the so the cash flow characteristics are performing exactly like what we anticipated. And so you know, as we exit 2019, I think people will be comfortable with our ability to manage their debt. You know, people talk about $170 billion debt. Well it’s a $60 billion EBITDA company, okay? So the debt is imminently manageable. And so people get more secure with the dividend, and I’m confident as we go through 2019. JOE KERNEN: Do you hear things about the time frame for finding out, you know, the latest challenge from the government on the deal? It was supposed to be the end of this month, wasn’t it? JOE KERNEN: Do you know? RANDALL STEPHENSON: Our lawyers’ expectation is it should be this month. We should hear something. JOE KERNEN: Any — any body language about — is there anything new because the last — that judge was so definitive last time. JOE KERNEN: Yeah. How’d those go? RANDALL STEPHENSON: — in front of the circuit court in December. And we left those – those arguments feeling very good about how the discussion went. But, you know, it is the courts, so you don’t know until you get the ruling from the judges. But we’re feeling comfortable right now. BECKY QUICK: Andrew has a question, as you can probably hear him saying. RANDALL STEPHENSON: Yep. Good ahead Andrew. ANDREW ROSS SORKIN: --But I did want to ask you about it because it is making news. Sprint filed a federal lawsuit yesterday against AT&T over your use of 5GE in your marketing. This is – this sort of next generation 5G, I guess what you are calling the 5G evolution in place of LTE. They’re saying that that is effectively marketing fraud, that AT&T doesn’t have a 5G service available to the public yet. What do you — how do you respond to that? RANDALL STEPHENSON: Well, it will play itself out, obviously. But we feel very comfortable with how we have characterized the new service that we’re launching. What we do, Andrew, is we go into a market, and we turn up a significant block of Spectrum wireless air ways that we own. I mean, it is rather dramatic. And we’re deploying new technology, but I won’t go into the details of it. But when we go in a market, and we turn up this technology, and we light up this Spectrum, our customers are seeing radical increases in speed and performance on the network. And this is a step. This is a step that is required to get to ultimate 5G. And it’s an evolutionary step to 5G. It’s a critical step. So we are characterizing this as 5GE, 5G Evolution. We obviously have done our homework. We’ve done a lot of work around how we characterize this. And we’re being very clear with our customers that this is an evolutionary step. This is a dramatic step change improvement in what the customers’ experience where we turn this up. And I fully understand why our competitors might be upset with this. It is not a play everybody can run. It’s a play that we really like and it’s a play that will differentiate us in the marketplace as begin we roll this out over the course of this year. JOE KERNEN: Are you — are you going to the Oscars this year? RANDALL STEPHENSON: You probably won’t see me at the Oscars this year. RANDALL STEPHENSON: Stankey. Stankey better be there. JOE KERNEN: He’s your mogul representative? RANDALL STEPHENSON: He’s our mogul. He just screams mogul, doesn’t he? JOE KERNEN: I always saw you moving out there and just hobnobbing with all of them. No, I didn’t see that, actually. But anyway. Thanks very much. RANDALL STEPHENSON: Good seeing you guys. Thank you for being here. BECKY QUICK: Thank you. Randall Stephenson. Andrew, we’ll back to you. 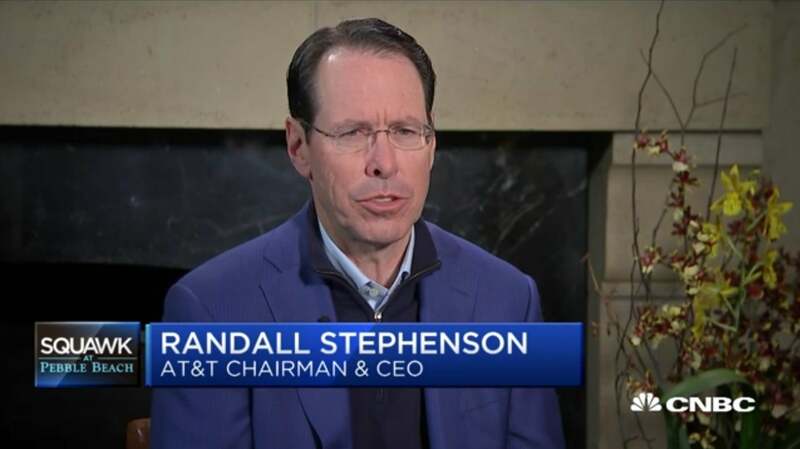 The post AT&T CEO Randall Stephenson On 5G Lawsuit appeared first on ValueWalk. This entry was posted on Friday, February 8th, 2019 at 11:20 am and is filed under Immediately available to public, ValueWalk. You can leave a response, or trackback from your own site.